¾ of children and adolescents with cerebral palsy are ambulatory, either with or without an assistive device. Individuals with Cerebral Palsy are more likely to ambulate slower and with a greater energy expenditure compared to individuals without this diagnosis. Much of this decreased gait efficiency can be dependent on the conditioning of the cardiorespiratory and musculoskeletal systems. It is thought that increasing aerobic activity will have a positive effect on the two systems and on overall gait efficiency in individuals with cerebral palsy. The intensity of spontaneous activity isn’t thought to be high enough in order to make a vast improvement on these systems, so a training program must be specifically targeted. The purpose of this article was to examine the effect that a group aquatic training program had on improving gait efficiency in children and adolescents with cerebral palsy. This study was conducted at the University of Quebec in Montreal, Canada. The study consisted of 12 adolescents, ages 14-21 years, diagnosed with spastic cerebral palsy. 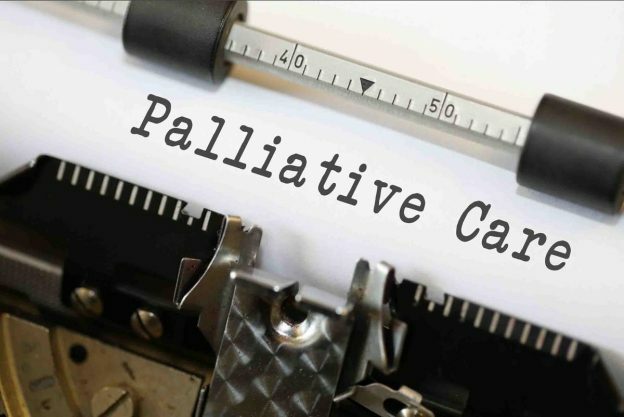 Subjects were required to be able to follow verbal instructions and be independent with ambulation with or without an assistive device in order to be included in this study. Subjects with known cardiovascular disease and/or recent botulinum toxin A injections were excluded in order to prevent any additional variables from affecting the study. Throughout the study, subjects continued to receive any additional physical therapy and were asked to follow their usual medication regimen. 15 minutes aquatic play activity – in the shallow end of the pool; consisted of modified synchronized swimming, a balloon game, volleyball, and standing on a floating board. Data collection was done the week before the training program commenced and the week after its conclusion. Data collection consisted of a gait analysis for 6 meters, utilizing sixteen 14mm diameter markers placed bilaterally on the ASIS, PSIS, lateral aspect of the knee joints, lateral malleoli, heels, second metatarsal, and lateral aspects of the thigh and calf segments. Heart rate was also measured while subjects walked at a comfortable pace, using the following calculation to determine energy expenditure (EEI): EEI = (walking HR – resting HR) / walking velocity. Isometric strength testing was also conducted on the right and left quadriceps and hamstrings, in that order. 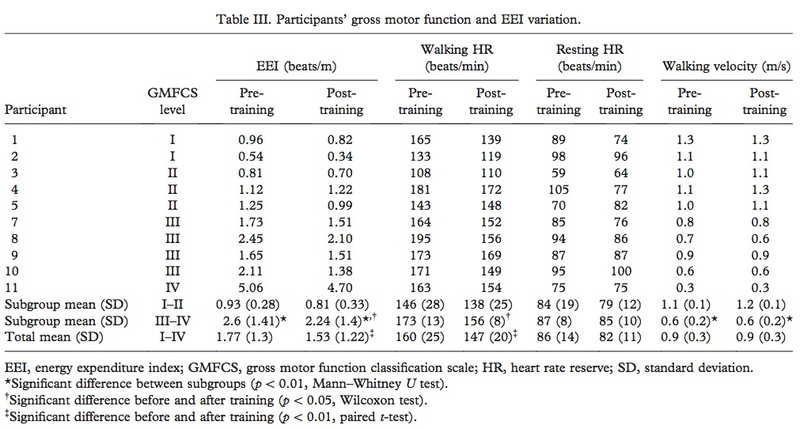 In order to determine the functional level of each subject, the Gross Motor Function Measurement (GMFM) sections D (standing) and E (walking, running) were used. Two participants dropped out of the study after the 5th week due to “lack of motivation.” Although the study reported that 10 participants successfully completed the training program, data was reported for 11 subjects (Table III). Heart rate (HR) was only successfully collected, using the HR monitor, for only 8 of the subjects. Utilizing this HR data, it was determined that the intensity of each session was over 40% heart rate reserve; however, subjects with GMFMCS levels of I-II exercised at this intensity twice as much as the subjects with greater disability (GMFMCS levels III-IV). Overall, as reported in Table III, EEI was significantly decreased (improved) in 10 subjects and walking HR was decreased in 9 out of 11. When subjects were subdivided into subgroups based upon GMFMCS, it was found that those with higher function (levels III-IV) showed significantly lower EEI and increased walking velocity compared to those with lower functional levels. In GMFMCS levels III-IV, training was correlated with a significant decrease in EEI whereas levels I-II only demonstrated a positive trend between the two. Post-training gait analysis was considered a “secondary outcome measure” and therefore reported in considerably less detail, stating only that training increased opposite foot off and foot off variables. This study exhibited many strengths and weaknesses. It was unclear as to why data was reported in 11 subjects, when only 10 successfully completed the study. Additionally, the study either did not report or did not perform any post-training isometric strength measurements. The authors did not clarify how EEI was determined in those subjects without HR data, which leads me to question the validity of these measurements. While the study could have been improved with a larger sample size and clearer results, I think they were able to appropriately demonstrate the decrease in EEI in children with cerebral palsy that was associated with an aquatic training program. Incorporating play into a training session for children with cerebral palsy is an excellent way to increase their amount of physical activity incorporated into their daily lives. With no reports of pain or injury by the subjects, this is a relatively low-risk intervention to implement in a pediatric environment. 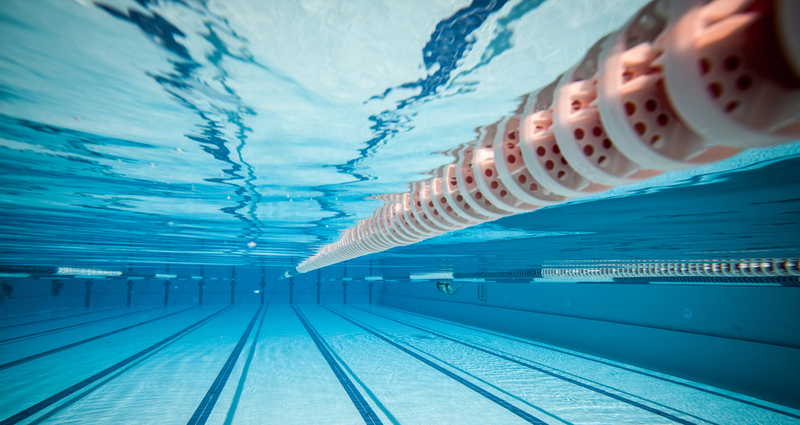 The water temperatures of 31-32°C is that of a recreational pool, which increases the availability and feasibility of implementing such a training program. Based upon an individual’s functional level, history and ability to participate in such a program, I would certainly consider the use of an aquatic training program in an appropriate candidate to improve the gait efficiency in a child with cerebral palsy. Ballaz L, Plamondon S, Lemay M. Group aquatic training improves gait efficiency in adolescents with cerebral palsy. Disabil Rehabil. 2011; 33 (17-18): 1616-1624. No Comments on Does group aquatic training improve gait efficiency in adolescents with Cerebral Palsy?